Council for the Indian School Certificate Examinations (CISCE) announced the ICSE Results 2014. 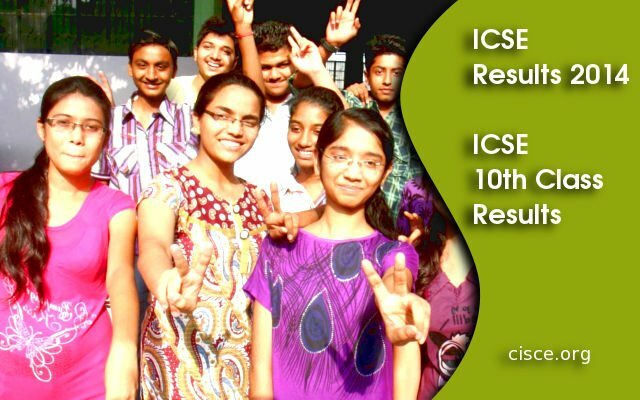 ICSE 10th class results 2014 are available on the official website of CISCE. CISCE conducted ICSE Exam 2014 from March 3 to March 29. Select The course as ICSE. ICSE Results 2014 are available through SMS . School Principals can download ISCE School wise result 2014 tabulation by logging into the 'Careers' portal of the Council by using the principal's login ID and password. The tabulation will also available on the registered email IDs of the schools. Schools may also approach the helpdesk at 022-67226106 for obtaining an additional copy of the tabulation through email. ICSE Class 10 Examination was conducted in 2,500 ICSE Schools all over india.The evaluation of answer sheets taken place650 centres. It was held in 64 written subjects out of which 23 are Indian languages and the rest are foreign languages. The evaluation process for a substantial part of the ICSE exam has been done online this year in order to make the examination and evaluation processes transparent, accurate and time saving for the education authorities. Pass Percentage of ICSE 2014 is 98.28% . There are 1, 49,087 Candidates Appeared for ICSE 2014 Exam. The best pass percentage was achieved by the southern region (99.66 per cent), followed by the Western region (99.46 per cent), Eastern region (98.02 per cent) and Northern region (97.30 per cent). ICSE Class 10th students are required to clear at least six subjects. One of it should be English, any Second Language and History, Civics Geography (compulsory subjects) and any three optional subjects to receive ICSE certification. Indian School Certificate (ISC) Examination and Indian Certificate of Secondary Education ( ICSE ) was intended to provide a review in a general learning course , in keeping with the recommendations of the new education policy 1986. private students are not allowed to sit for ICSE 10th class / ICSE class X and ISC class 12 / ISC class XII board exam .